Harpist for all occasions! Weddings, ceremonies, receptions or any party. Travels to Utah, Idaho, Wyoming, Colorado, Nevada and Arizona. 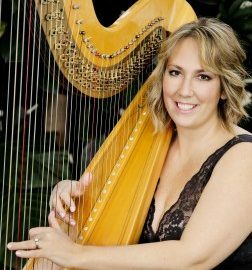 Get A FREE Brochure from "Monica Smith – Harpist"
For over 20 years Monica Smith has been playing the harp at wedding ceremonies, cocktail hours and receptions as well as other events and special occasions. She is available to play in Utah, Colorado, Wyoming, Idaho and Nevada. Monica loves being a part of people’s special days. When she is not playing the harp, she enjoys traveling with her husband and keeping busy with her 3 daughters daily lives. She loves spending time outdoors! Having played at weddings for over 17 years, she has plenty of suggestions and recommendations for your special day. She knows that weddings are unique to each couple, and will do her best to accommodate your special requests. Prelude music is usually 15-30 minutes before the ceremony to help set the mood as guests are arriving. Some couples also chose to have music played during their ceremony. She is happy to discuss and accommodate those needs as well. To determine the exact musical needs for your special day, please Monica. Please mention this ad when you contact Utah Wedding Harpist!